Jeremy Corbyn says he is seeking a "constructive alternative" to the PM's deal, in order to prevent a no-deal Brexit. The Labour leader was speaking after meeting the EU's chief Brexit negotiator, Michel Barnier, for talks in Brussels. "We are therefore looking at alternatives, and building a majority in Parliament that can agree on a future constructive economic relationship with the European Union," he told reporters after the meeting. Independent Group spokesman Chuka Umunna described the Labour leader's behaviour as "juvenile" at a time of national crisis. 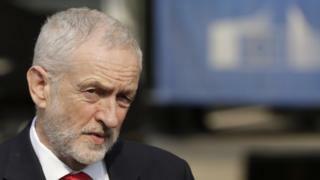 Mr Corbyn said there had been "a confusion" over the meeting, and he had held separate discussions with Mrs May later on. "I'm also arranging to meet the prime minister next week again on a one-to-one basis," he added. Labour has backed an extension of Brexit talks to find an alternative to the prime minister's deal which will command a majority in the Commons. On Wednesday, Brexit Secretary Stephen Barclay said Labour's plans were "not credible", and the party was asking for "things that are simply not on offer".